The training provided in this course and the experience you can acquire can be of importance in your future if you are thinking about archaeology in a professional level. If you are thinking for the first time to be a volunteer in an archaeology field school, this course could be right for you. This program accommodates participants with or without previous experience. On a normal working day at the Field School, students wake up in the morning and have breakfast at the students' residence before the staff members pick them up with the vans. Then we take a ride to the North of the island to get to the beautiful port of Sanitja, where the Roman city of Sanisera is located. 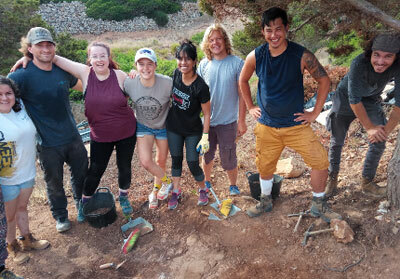 Once there, students devote 4 hours to fieldwork, where they learn proper excavation techniques to improve their skills, while they dig in different buildings in an area of the city very close to the sea. After fieldwork we go to the Sanisera Archaeology Institute, where students have a sandwich break to get some energy back! Our center holds the laboratories, where students work with the Roman pottery found on site. The main aim is to wash, label, classify and prepare the materials' inventories. Also students are given lectures on Roman pottery typologies (both for amphorae and fine wares), History of the site, archaeological practice and methodology and Classical History in the Western Mediterranean. Digging at the Roman city of Sanisera is a first-hand experience to get an insight on the Classical world in a Mediterranean island.